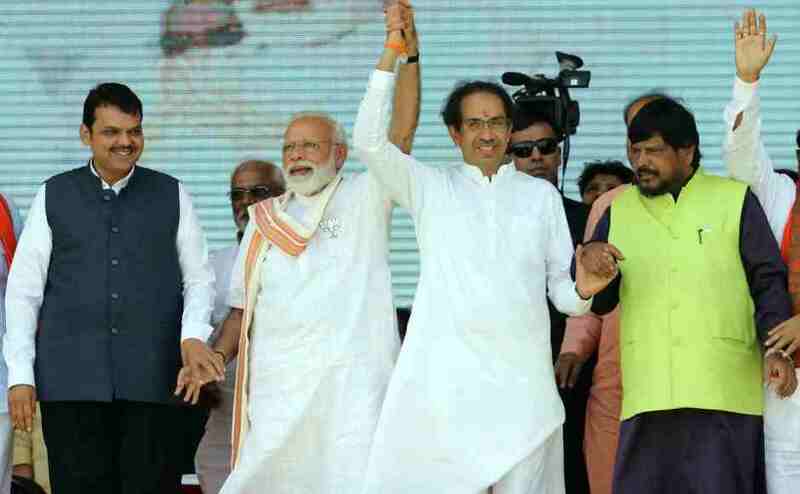 Prime Minister Narendra Modi and Maharashtra chief minister Devendra Fadnavis on Tuesday shared the stage at Ausa in Latur with Shiv Sena chief Uddhav Thackeray, who has often been unsparing in criticism of the NDA government at the Centre. 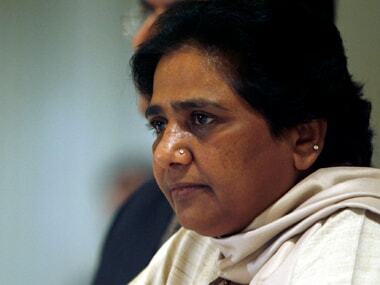 This coming together of the leaders, on the last day of campaigning for the first phase of 11 April Lok Sabha polls, came after a gap of nearly four years. Modi and Thackeray had last shared the dais in Mumbai in December, 2016, at a function to lay the foundation stone of the Chhatrapati Shivaji Maharaj memorial off the Arabian Sea. The Sena has almost continuously targeted Modi and BJP president Amit Shah, before entering into a seat-sharing arrangement for Maharashtra, in which the saffron party will be contesting 25 seats and Shiv Sena, 23. Slamming the Congress over its stand on Article 370, Modi said, "Congress speaks the language of Pakistan. The grand old party says it will not abolish Article 370 from Jammu and Kashmir. Pakistan also says the same thing." 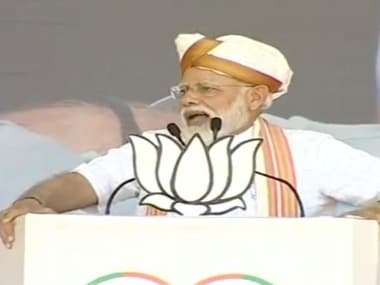 He also slammed the Congress-Nationalist Congress Party alliance over their alleged support of the demand for a separate prime minister for Jammu and Kashmir. "The Congress will have to answer every citizen of the country for the decisions they have taken in the past," he added. The Congress has been facing sharp criticism from the saffron party for contesting elections in agreement with the National Conference (NC) party, led by Farooq Abdullah and Omar Abdullah, in Jammu and Kashmir. Attacking the Congress manifesto, the prime minister further said that it aims to weaken our security establishment. "Congress and its friends have anti-national thoughts. Language that the grand old party speaks is the same as that of Pakistan. Had the party stood its ground in 1947, Pakistan would not even have been born," he said. The PM went on to speak about the recent Balakot air strikes, slamming the Opposition for asking for "proof". "The Opposition has disregarded the country's national security. How much proof do they want? How much evidence does the Congress need from the country's military? How much evidence is needed from the Air Force? Those who do not trust the government and our brave soldiers should be punished," he added. 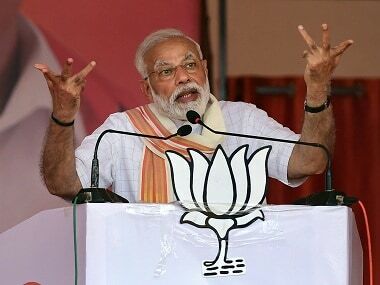 Speaking about the recently released BJP manifesto, Modi said that the party went beyond its promises made in the 2014 manifesto. "The PM-KISAN scheme is now depositing money directly into the accounts of 1.2 crore small and marginal farmers. The BJP in its Sankalp Patra has declared that the scheme will be extended to all farmers after the election, when our new government gets elected." He also appealed to first-time voters, pitching for a strong case by connecting air strikes with nationalism. "Do you want to vote for the brave soldiers? For those who lost their lives in Pulwama? Or do you want to vote for an indecisive government?" Millennials are likely to play a decisive role in this year's elections considering the fact that there are nearly 15 million new voters in the age group of 18-19 years. No wonder then that minutes after the Election Commission had announced its schedule for the 2019 Lok Sabha elections early in March, Modi took to Twitter to "particularly call upon first-time voters to vote in record numbers". He went on to further target the Congress over the recent I-T raids on Madhya Pradesh chief minister Kamal Nath's associates. "The Opposition is calling the chowkidar chor but from whose houses did those notes of money come from? 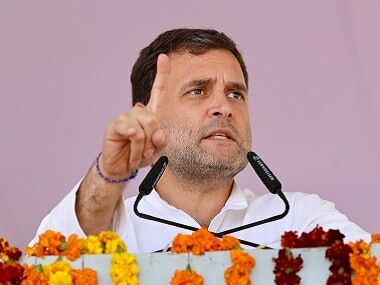 It has been barely six months since the Congress had formed its government in Madhya Pradesh but the first thing the party engages in is corruption," he said. The prime minister also promised a separate ministry of water for drought-hit Latur which, he promised, will ensure fair distribution of water. Modi and Thackeray addressed the gathering in support of alliance candidates in Latur and Osmanabad, where polling will be held on 18 April. BJP and the Sena had contested the 2014 Maharashtra Assembly elections, the 2017 BrihanMumbai Municipal Corporation (BMC) elections and the 2018 Palghar Lok Sabha by-election separately and against each other.